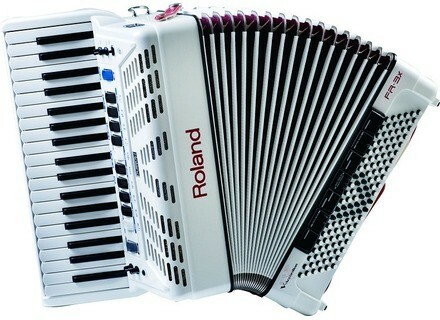 FR-3X, Accordeon from Roland in the FR series. The FR-3X is described as "a fusion of traditional accordion performance and modern digital functionality." With the FR-3x, accordionists can switch between an Italian jazz accordion, to German folk, French musette, Russian bajan, or a variety of other accordion sounds without changing technique. Orchestral sounds are onboard the FR-3x as well as a Virtual Tone Wheel generator for preset organ sounds with bellows pressure control. Percussion sounds can even be played with the left hand using the bass and chord sections. The FR-3x and accompanying button version (FR-3xb) will also be available in a special edition white version, with a decorated bellows and genuine leather Alcantara straps. [NAMM] Roland FR-1 Accordion Roland announced the new FR-1 V-Accordion that weighs twelve pounds and can simulate up to seven different distinct accordions, access four different organ presets with rotary effect, and play along with a variety of beats by adding drum sounds to the bass and chord buttons. Roland FR-1 V-Accordion So new that no picture is available at the time of writing, the Roland FR-1 is the latest and most affordable addition to the V-Accordion range. While this impressive entry-level instrument has many of the features of the larger V-Accordion models, its compact size and weight make it the perfect instrument for young players or stage use.